After enjoying five consecutive months of gains, US stocks had a terrible month of October, dropping almost 8% from their highs reached early in the month. Third quarter GDP growth was a very strong 3.5%, buoyed by robust consumer spending. Corporate earnings beat already-high expectations. So why then did the market have a sudden change in attitudes that lead to the October pullback? We often receive questions about the economy, politics and world events and their impact on stock prices. We usually answer that all three matter, but the most important entity was, remains and always will be the Federal Reserve. Fed policy has its biggest impact on stock prices (and eventually the economy) when it is increasing interest rates and reducing liquidity. The Fed adopted the unusual policy of driving short-term interest rates to zero as a consequence of the financial crisis of 2008. The Fed also helped reduce long-term interest rates to record lows by buying nearly $4 trillion of longer-term Treasuries and US agency debts. But, the goal of faster economic growth and 2% annual inflation that the new policies were hoping for never really materialized between 2009 and 2016. Now the Fed has been raising short-term interest rates to return to a more “normal” monetary policy. The tax cuts that came into effect in 2018, higher military spending and reduced regulatory mandates have produced the stronger growth of this year. The Federal Funds rate now is 2.00%-2.25%, up from zero percent just three years ago. Inflation remains below 2% as measured by the Personal Consumptions Expenditures Index. And the US dollar has increased vis-à-vis other major currencies. 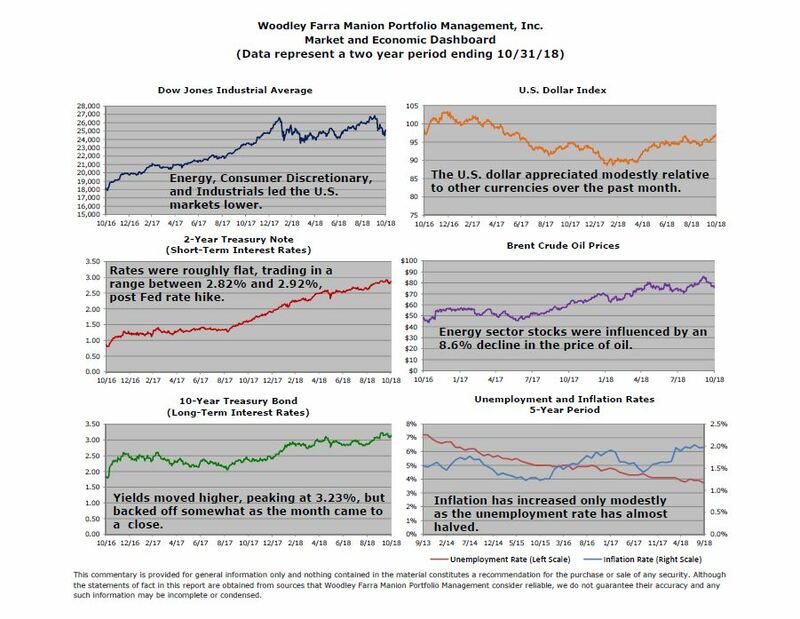 So it is this significant change in fiscal and monetary policy that is now the major cause for worry among investors. Indeed, more investors are calling for the Fed to pause the rate hike cycle to assess the impact of all the recent changes. Traditional monetary policy believed low unemployment will cause inflation. In 2015 the Fed estimated an unemployment rate of 5.1% would trigger higher inflation. It has since reduced that number to 4.5%. Actual unemployment is 3.7% and inflation remains under 2%. More and more people are returning to the labor force as evidenced by the strong monthly jobs reports. This may be the most significant factor in keeping wage growth restrained, and therefore inflation as well. If inflation exceeds the 2% target, then the Fed should take appropriate actions to keep it in check. But until it becomes a real problem, the Fed should allow the economy to continue to strengthen to allow as many Americans as possible to participate.